If I had to choose just one food to prep every week, 100% I’d choose hard boiled eggs. They’re a versatile protein packed with nutrition that I can add to most any snack or meal. But for the longest time I had one problem: I found myself searching Google for, “how to hard boil an egg,” every. single. time. As simple a food as hard boiled eggs are, sometimes they seem WAY too complicated! Right? Like do you start to boil the eggs in cold water or hot water? Do you cook the eggs in boiling water or take them off the heat when the water starts to boil? Ice bath or no? Fresh eggs or old? And for the love of protein, does anyone actually know how long it takes to cook hard boiled eggs?! I don’t like not having answers to seemingly simple questions. So, I set out to test the most common ways the Internet says you can hard boil an egg and find answers to all the small questions that came up along the way. 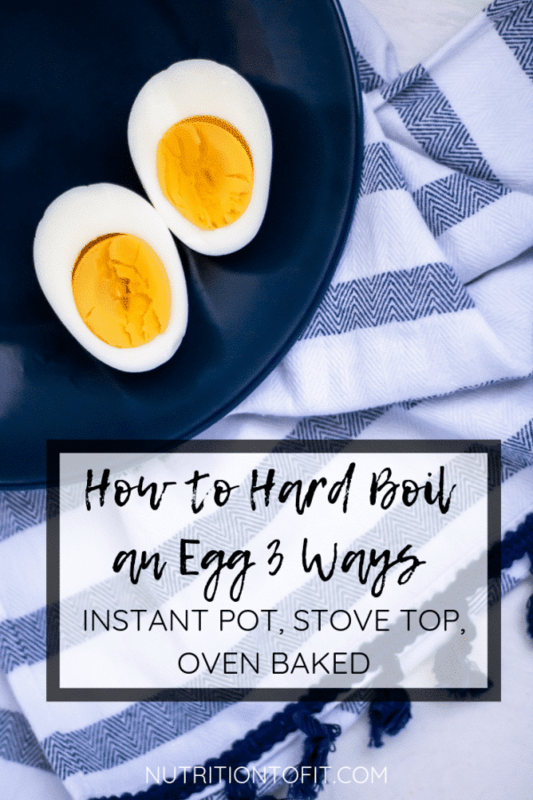 Below you’ll see my details on how to hard boil an egg three ways: on the stove top, in the Instant Pot, or in the oven. I’ve also ranked them from my favorite to least favorite method, based on quality and consistency of results and ease of preparation. Hard boiled eggs in the Instant Pot (affiliate link) are by FAR my favorite way to make hard boiled eggs. I absolutely always get perfect hard boiled eggs. 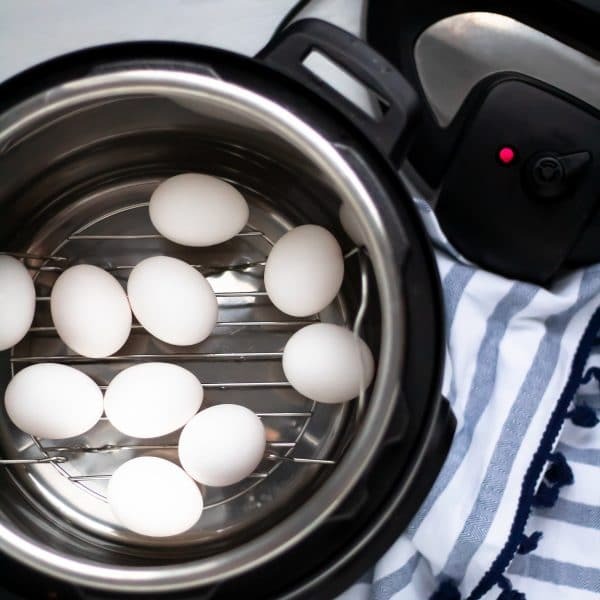 The Instant Pot method is fast, low-maintenance, and always makes the easiest to peel hard boiled eggs. Add 1-1.5 cups of water to the bottom of the Instant Pot (depending on the size of your Instant Pot, just check to see what the minimum amount of liquid it requires to operate and that’s all the water you’ll need. Mine is this 8 quart Instant Pot and needs 1.5 cups minimum liquid). Place the metal trivet in the Instant Pot over the water. 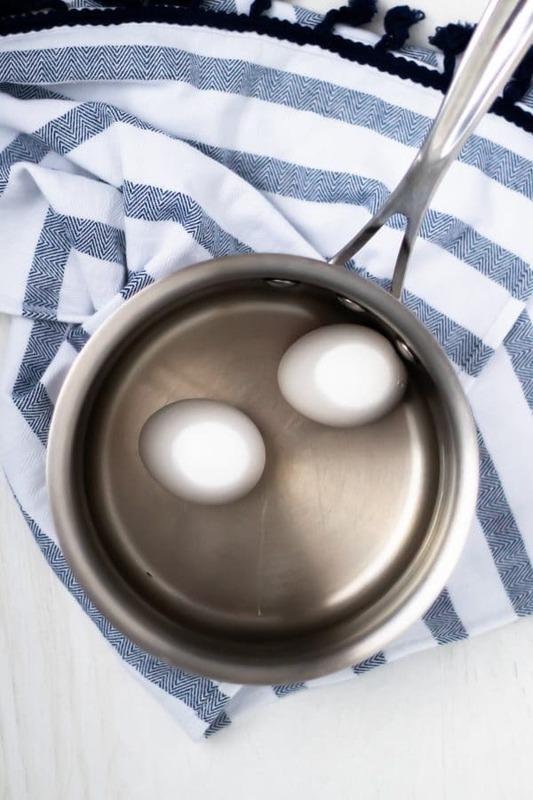 Place eggs in the Instant Pot on the trivet (doesn’t matter how many – I’ve done this method with anywhere from a few to eighteen eggs at one time). Close the lid to your Instant Pot and make sure the vent is set to sealed. Set the manual settings to high pressure for five minutes. When done, immediately do a quick release (always be careful, please!) and then transfer eggs to an iced bath for at least ten minutes. Peel and store in an airtight container in the fridge up to one week. P.S. Technically these Instant Pot eggs aren’t actually “hard boiled”, but rather steamed under high pressured. For the intent and purpose of this post, however – we’re still going with it. In my opinion this is still the best and easiest way to create the same desired end product. Favorite egg runner up goes to the classic, true hard boiled egg in a pot on the stove top. The main reason this method isn’t my favorite is because I hate having to wait until the eggs are boiling to set a timer or remove from the heat. I have a two-year-old and a two-month-old…all my fellow mamas out there completely understand my inability to remain distraction-free and not be needed a thousand times over while waiting and watching carefully for water to come to boil. Half the time by the time I realize the water is boiling it’s probably been more than a few minutes, which often results in me accidentally overcooking the eggs. The other reason stove top hard boiled eggs aren’t my first choice is because I feel like I always struggle to get the shells peeled cleanly. Place eggs in a pot and cover with cold water up to an inch over the eggs. Cover the pot with its lid and bring to a boil. Once boiling, cook for 6-7 minutes over medium-high heat (if your burners have numerical values, I did mine at heat level 6). Turn off burner and immediately transfer eggs to an ice bath. Let cool in ice bath at least ten minutes. Note: I prefer my eggs cooked for 6 minutes, plus that gives me a little extra wiggle room if I don’t start the timer as soon as the water starts boiling. 😉 Go for 7 if you prefer your yolks even firmer! When I first heard that you could bake eggs in their shell in the oven and they would result just like hard-boiled eggs, it seemed a little too good to be true. Well, the good news is that it’s definitely possible! And it’s pretty low-maintenance in that you just have to put the eggs in the oven then transfer to an ice bath when done. The bad news is that the quality isn’t quite there. 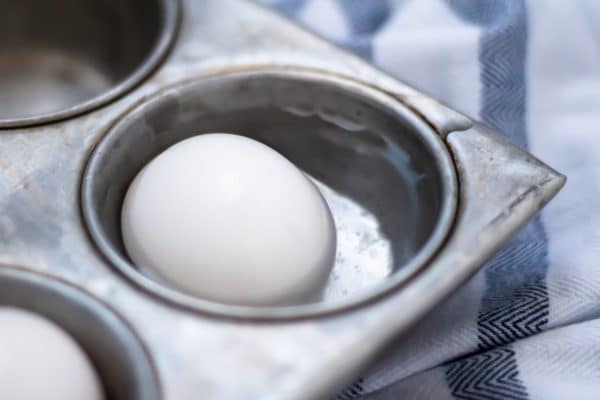 Baking hard boiled eggs in the oven results in a completely edible egg, but you’ll get discolorations (and not just limited to the shells, but discolored tints and marks on the egg whites themselves, too). If you don’t care about presentation or appearances and need to use your stove top or Instant Pot for other preparations – go with this oven method. If you want “pretty” eggs for something like a salad you’re serving guests or need “clean” egg shells to dye for Easter, don’t go with the oven baked method. Oh, and one of the tricks on the Internet is to bake each egg in a water bath by filling each muffin tin with water, then baking. The amount of shell discolorations were present, but reduced with this method. The spots didn’t transfer directly to the egg whites, but the egg whites were still slightly discolored with a yellow tint. 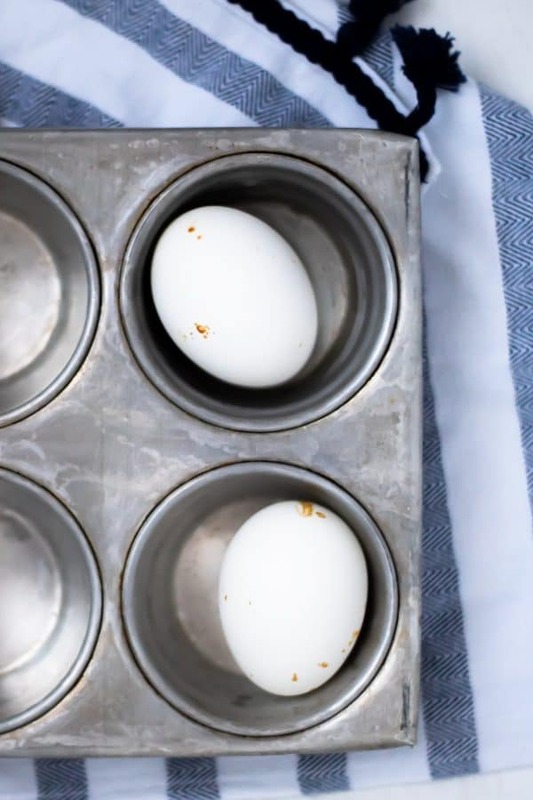 Place one egg in each muffin tin (you can make as many as you want at one time, it won’t affect cooking time or anything). Optional: fill muffin tins 2/3 of the way with water to bake the eggs in a water bath for reduced discolorations. Remove from oven and transfer immediately to an ice bath for at least ten minutes. Does it matter if you use fresh or older eggs? If your eggs are fresh, they will sink to the bottom of a cup of water. If they’re starting to get a little older, they’ll start to float slightly but still touch the bottom. If your eggs are bad, they will completely be floating at the top of the water. Do I have to put my hard boiled eggs in an ice bath? Yes! 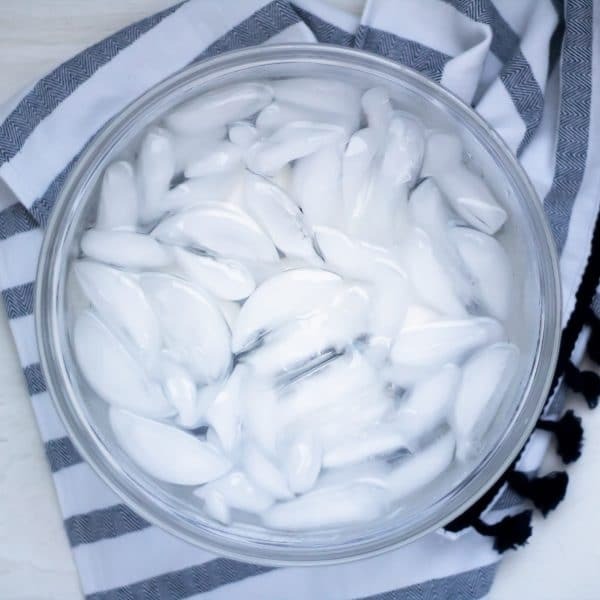 Does not matter which method you use, transferring the freshly cooked eggs to an ice bath will immediately stop the cooking so the eggs won’t end up overcooked. Plus I strongly feel this helps them peel better! How do you easily peel hard boiled eggs? I like to take eggs cold from the ice bath and gently tap them against the counter all over. Then I’ll gently peel. If I feel the eggshell needs a little extra help, I’ll try peeling under running water. 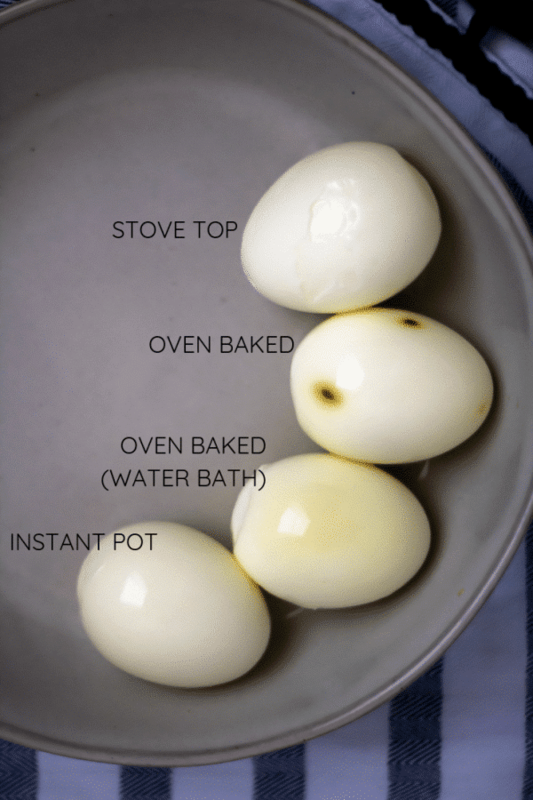 And if you have an Instant Pot, use that method to make your hard boiled eggs! Alway yields the hard boiled eggs that are most easily, perfectly peeled! Why are my hard boiled eggs green? Fun science fact: this discoloration is a result of a reaction between the sulfur in the whites and the iron in the yolks. How to store hard boiled eggs? Store hard boiled eggs in an airtight container in the fridge for up to one week. Some say hard boiled eggs will last longer when stored in water in the fridge. I personally don’t do this and have never had any issues. Yup! I’ve written a whole post on whether eggs are healthy, and for the majority of people there are definitely nutritional benefits to consuming eggs. 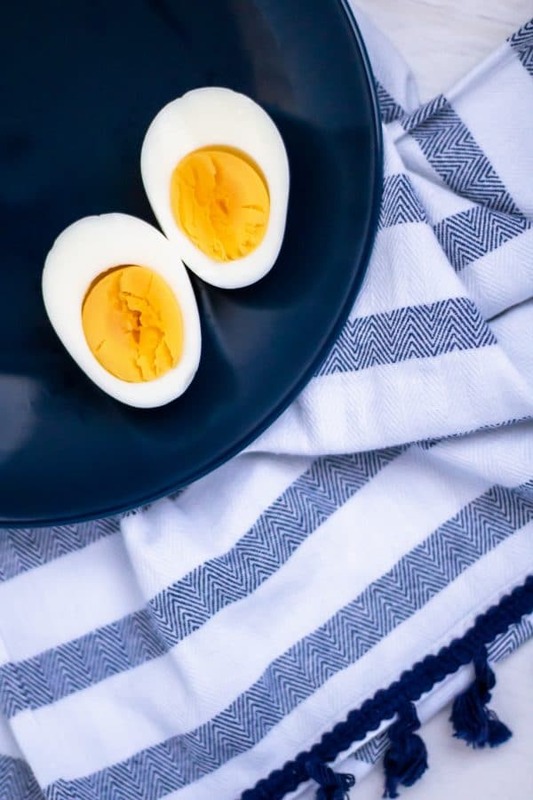 Hard boiled eggs in particular may be a healthier way of consuming bread as they are not cooked or fried in added fat, like fried and scrambled eggs may be. Can you make hard boiled eggs in the microwave? No, and for your safety, please don’t try! You can cook a scrambled egg in the microwave, but cooking an egg in its shell in the microwave can cause tremendous amounts of heat, pressure, and steam to build up in the eggshell. This could result in the egg exploding in the microwave (and who wants to clean that up?! Not I!). Plus that could possibly harm you or your family, and nothing is worth that risk. Should I add baking soda to the boiling water when cooking hard boiled eggs? You can, but I usually don’t. Remember – one of my goals in this “how to hard boil an egg” guide is SIMPLICITY. I’m looking for as low maintenance and as little to remember as I have to! 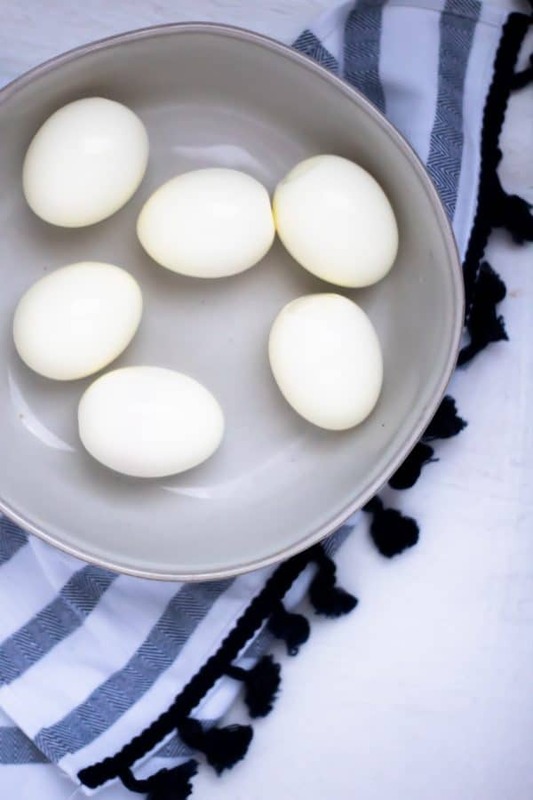 Some say adding about a teaspoon of baking soda to the pot of boiling water you’re cooking your hard boiled eggs in will make your eggs more alkaline, which may make them easier to peel later on. I did try this once before and didn’t notice any difference personally, but it’s harmless enough that you can certainly try yourself! Do you have any recipes for hard boiled eggs? Sure! 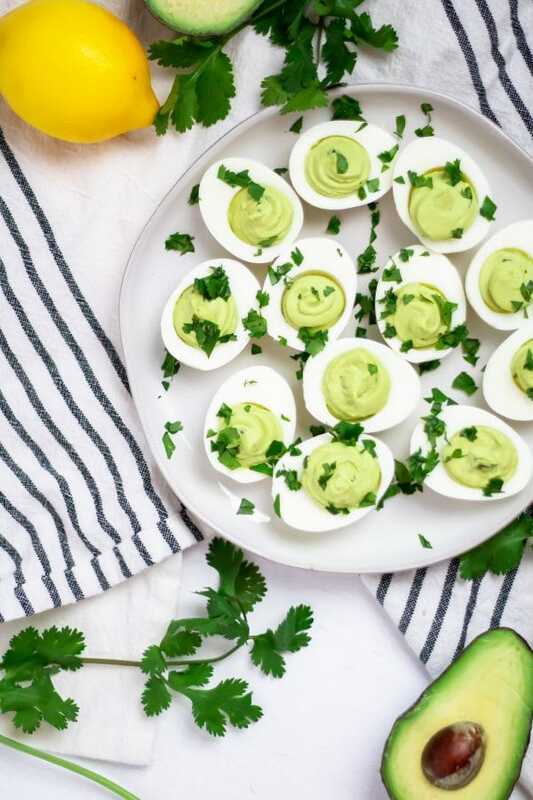 While I love to eat hard boiled eggs as-is for a snack or sliced on top of toast with hummus or avocado, I have a couple recipes here on Nutrition to Fit: avocado veggie egg salad and avocado deviled eggs (can you tell I’m a big fan of eggs and avocado together?). 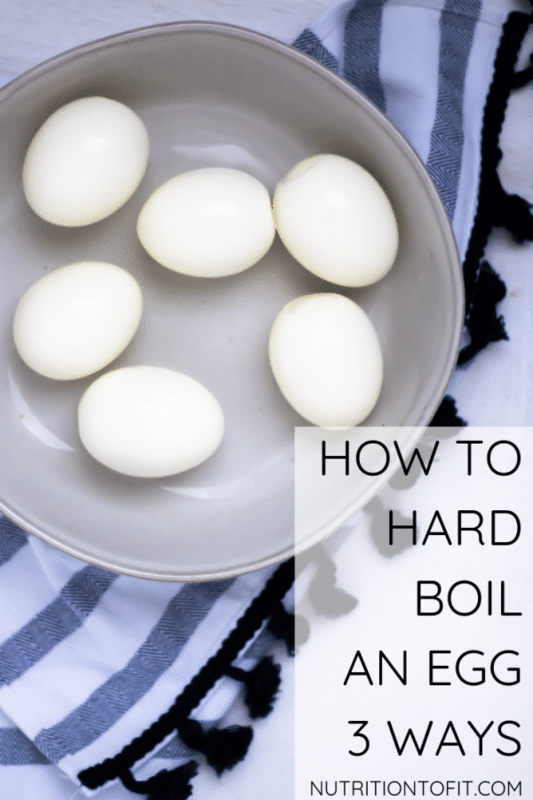 If you found this post helpful with learning how to hard boil an egg, please be sure to save it to Pinterest for later or share on Facebook or Instagram. Live well!